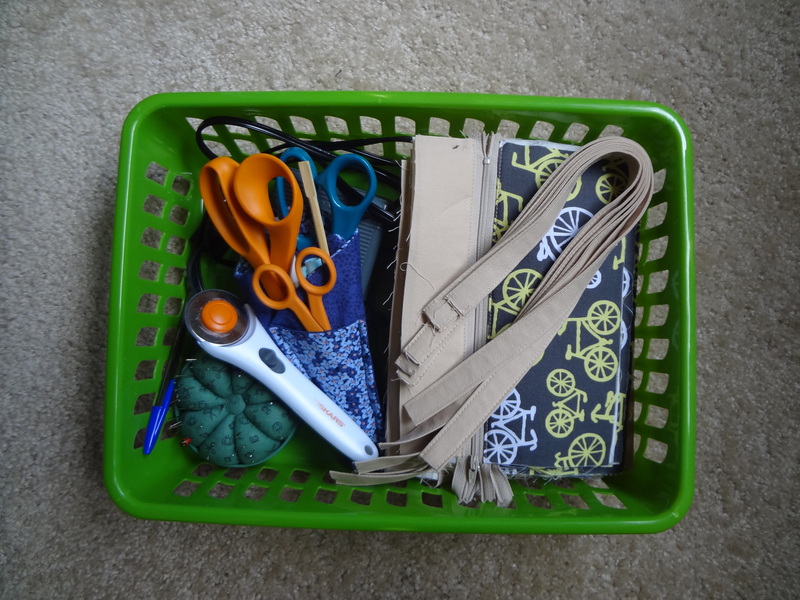 crafting | Bobbin & Co.
Often we (I) get in this trap of thinking, if only I had one more room in my home, one more day to a weekend, one more hour in day, then all my problems would be solved. The unfortunate reality is that once we have that one more thing, we’re left wanting something else. Would it be great if I had a whole room where I could keep my sewing machine up and have a Pinterest worthy organizational display? Yeah, sure I would love that, but the fact is that isn’t my current reality, and the more I think about it, the more I realize that I don’t need all that space. Want to see a picture of my Etsy shop? No, not every single thing I need fits in here, but most of the day to day tools and materials I use are easily stowed here, right in this chest in the living room. Nope, the sewing machine is not out all the time, but all I have to do is walk it about 7 steps over to my desk to get to work. My secret weapon for some of this organization is the dollar store. 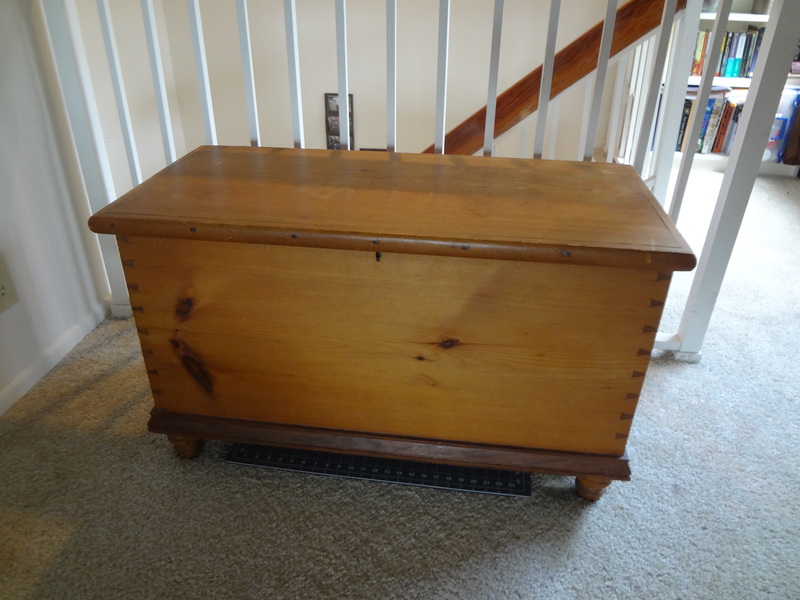 Selections often vary, but usually I can find storage containers for exactly what I need. When I get new fabrics I like to first wash them, and then press and cut them to size. 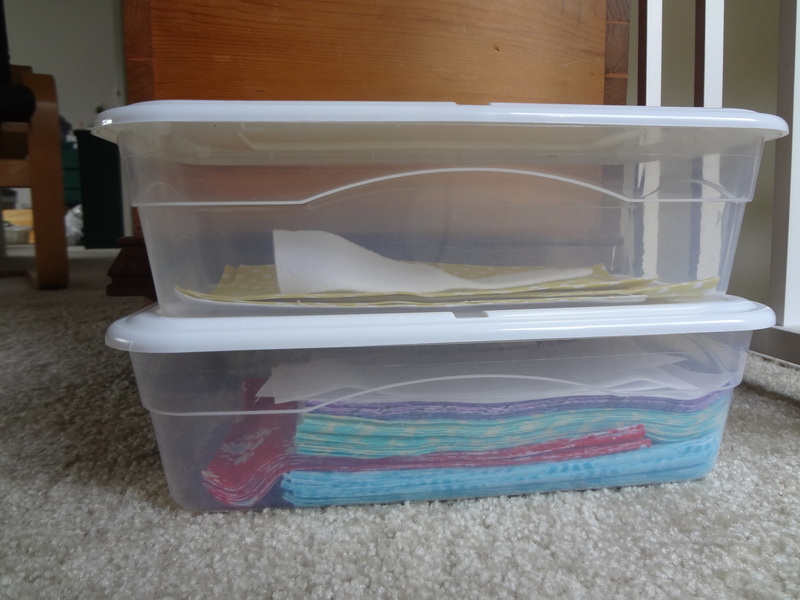 My cut fabrics then hang out in these containers so when I’m ready to sew, I can get started quickly. I keep whatever current project I’m working on in here. 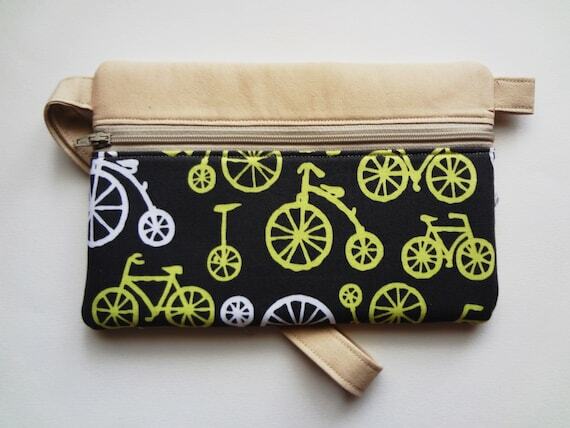 As you can see, I’m making more of the cute bike wristlets, so I’ve got all the pins, scissors, and cut materials in there. 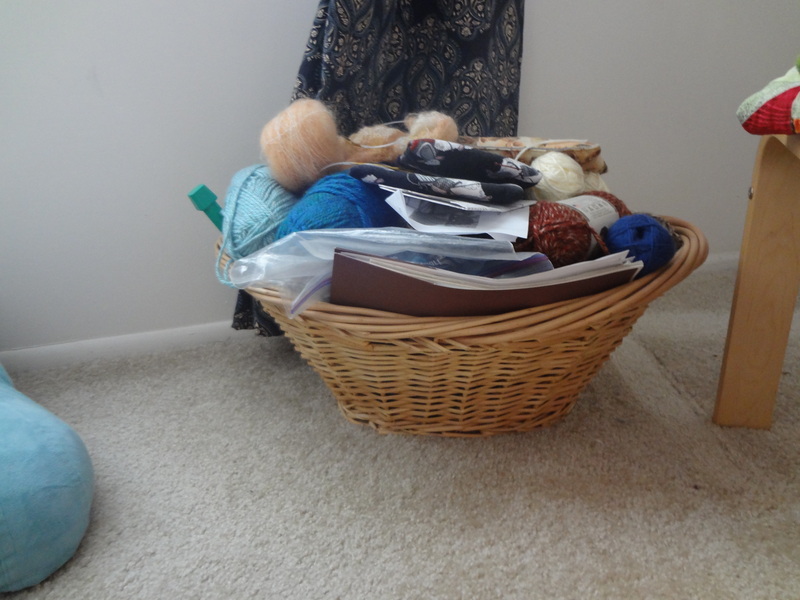 When I’m ready to get to work I only need to pull out the sewing machine, this basket and I’m all set. 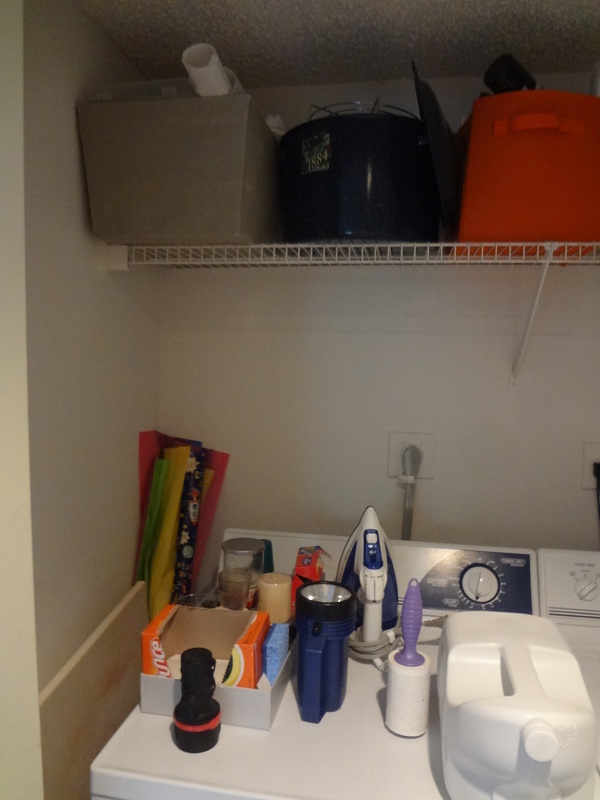 There are a few other spots in the apartment where I keep items that are not used on a daily basis. See that green bin towards the left on the shelf? That’s where all the scrap fabric goes. I’ve also got a bolt of interfacing and a bit left of a bolt of tan fabric, those are tall and thin to store on a closet shelf, and I don’t buy too much fabric ahead of time, so that’s not a big concern for storage. I’m guessing that most Etsy shop owners have more than one DIY interest, so aside from the shop there a few other things to keep track of. 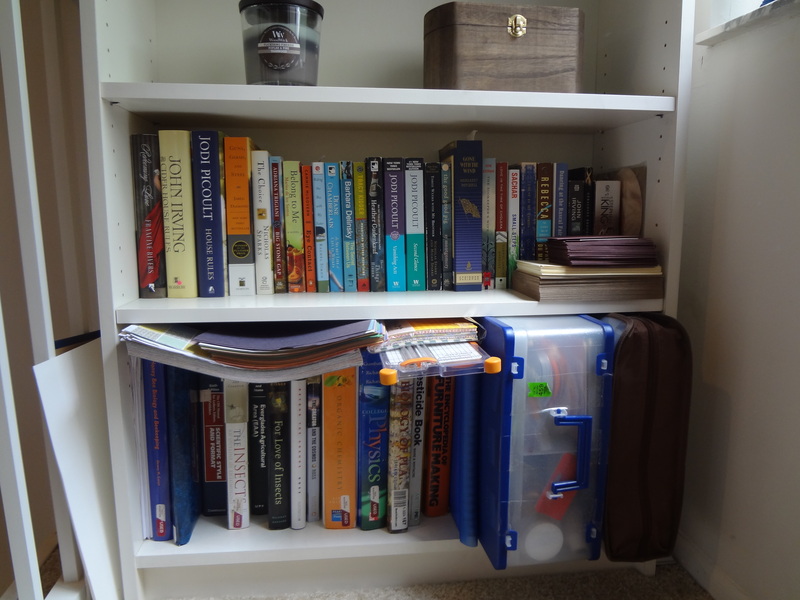 I have a few paper crafting/stamping supplies, and they easily fit on the bottom of my book shelf. It’s starting to get a little crowded, but for now it works. And finally, one of my first handmade fascinations was knitting. As any knitter who has made more than two projects knows, it’s pretty easy to accumulate excess yarn. The solution here was to buy a basket. 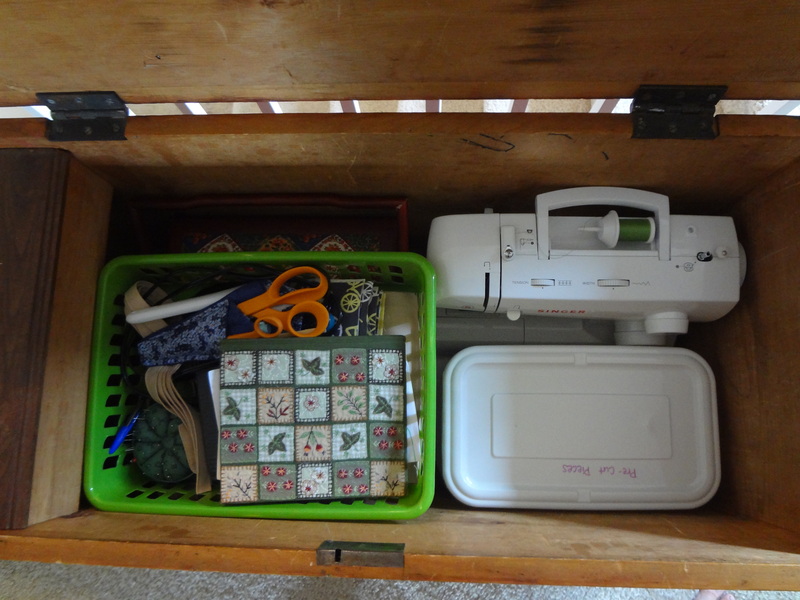 Initially, I had lots of yarn tucked away in plastic bags and I hardly touched it. New rule: I was allowed to get a basket and whatever could fit in the basket could stay. Obviously not everyone has to follow my plan, but this helped keep potential excess in check. Extra yarn was donated. My favorite way to limit excess is to have a set amount of space for stuff and then decide whatever doesn’t fit in that specific box or on a certain shelf is something I don’t need. How do you stay organized? Any good tips on deciding what to keep or purge when all the stuff starts getting out of hand? Hello, I'm Beth. I'm the owner, designer, and maker behind Bobbin & Co. Welcome! Play time before it turns to rain and melts. Now I’m drinking coffee, reading, and wearing a cozy sweater while watching the snow fall. My introverted, homebody self couldn’t ask for better conditions.